Source drives new revenues by maximizing brand and product integration strategies through hyper targeted brand activation in and across the screen, and facilitating "commerce in content" by literally letting the viewer transact and purchase against the inspired objects or moments in the content. 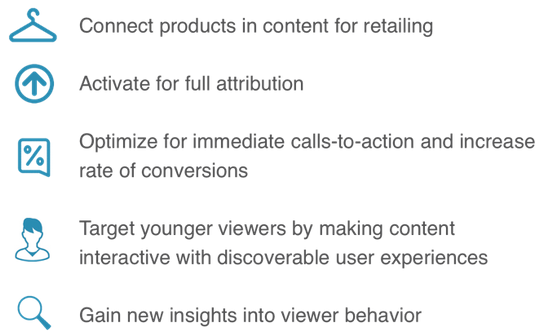 Source adds new viewers to your content by enhancing the content experience with hyper interactivity - adding depth to the contents story line and even letting the viewer communicate back across the story line. Underscoring all of this is a robust set of analytics that let the content owner and their brand and product partner know exactly what was happening at against any on screen object or moment in the content experience.